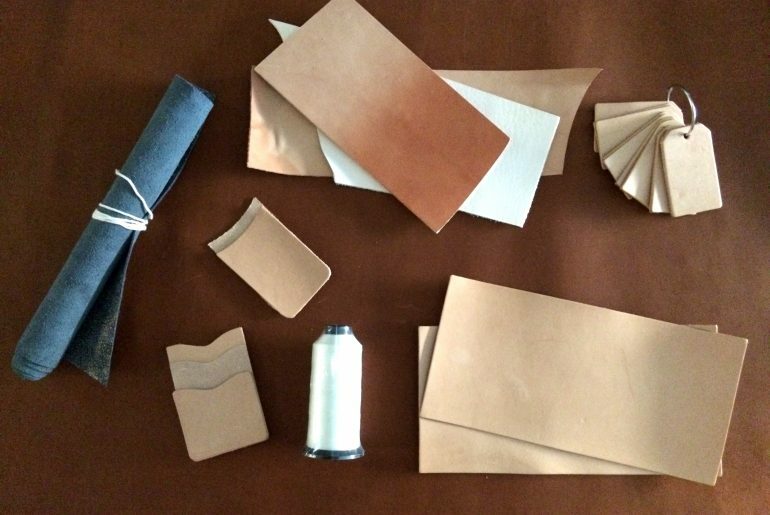 Getting into leather craft means learning a lot about new, cool tools. There are sometimes different tools used for the same job, depending on preference, skill, and sometimes budget. Whatever the project, it is helpful to know what tools are used for and which ones you’ll want to work with. 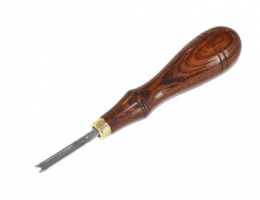 In this post we’ll check out an overview of the basic leather craft tools list. Beyond this, there are also many variations, and even customizations to tools that can best suit your preference. Each of these categories could have a post all it’s own, delving into the different types of each tool available along with the pros/cons of each. These are heavy, metal bases used as a very solid surface for hammering and working material on. 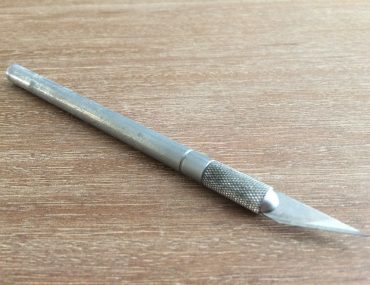 Tool with a sharp metal point used for marking or piercing leather. They can be used to impress a small mark such as where belt holes will go, or even dragged across leather to leave a mark such as when tracing pattern templates. Some come fixed with a single point, others allow points to be interchanged. Points include rounded and diamond shaped, where the diamond shape cuts the leather in such a way that it is easier to stitch through, and also leaves a hole in the leather that can sit more flat once punched. These are used to mark/make holes in leather that can then be used for stitching, or even stylistically for making patterns in leather. Generally, they are for making holes. 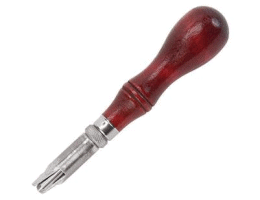 Tool that puts a crease in the edge of leather, often for aesthetic reasons, though can also be used for functional reasons when folding/shaping leather goods. 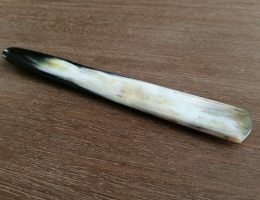 These devices, usually made of bone, can be used to help separate leather pieces (for example if a wallet is sewn tightly using a creaser can help open some of the pockets to get them flexible). 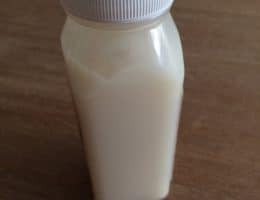 Since they are often polished bone, they will be gentles on the leather and leave fewer marks. 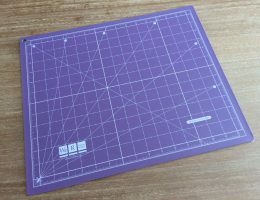 These are materials that often protect both a desktop work surface (from bing cut/marked by knife blades) as well as the blades used to cut on them. If blades are used on a hard surface, it can dull them quickly, which makes cutting more difficult and could leave rough cutting edges on the leather. 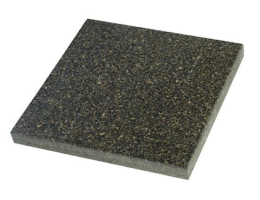 These cutting boards/mats provide a softer surface for the blade to rest on, which helps preserve the blade edge. Used to burnish leather edges. 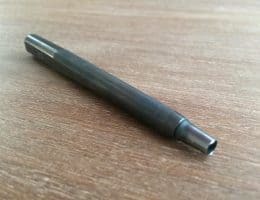 They help remove some of the fussiness on edges, producing a smooth, rounded edge that looks great, feels better, and holds up well during use. 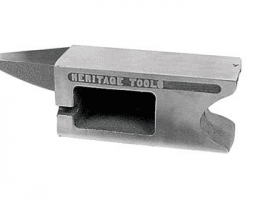 This can be hand tools used manually, specialized attachments for drills/rotary tools, or specialized machines. 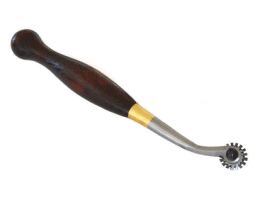 Used for shaving off the square edges of leather. For example, the edges of a belt or wallet, where having rounded edges would feel better in the hand and look more visually appealing. 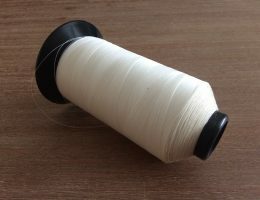 These are used to remove leather such as for stitch lines of folding lies. They can have fixed or adjustable depths. 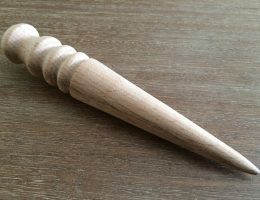 A tool used to apply a large amount of force, usually by pulling a lever. 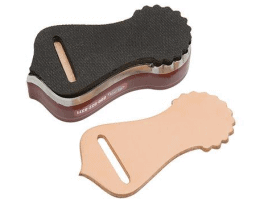 These work great for stamping out cuts of leather using pre-made metal dies, riveting, and embossing. The force they apply makes these tasks much easier to do. These are used for cutting the leather, from making large pieces of leather into smaller pieces, all the way to detailed shaping and carving. Visually every leather project requires a knife. 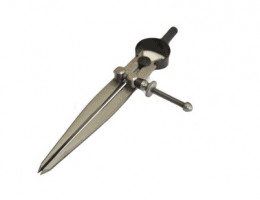 These can be simple utility knifes, modeling knives (such as x-acto), or specialized leather cutting knives that come in many shapes and sizes. 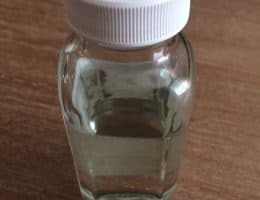 Used to remove leather finishes, waxes, and greases to prepare it for dyeing. This provides a cleaner state of the leather for the days to absorb into. These are formed metal shapes with cutting edges, used to press into leather and cut out a specific shape. For example, once a leather crafter designs a new wallet, they might have dies made of each piece so they can quickly press/cut the shapes, instead of doing each one by hand. 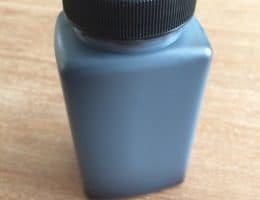 A pigment that gets absorbed by the leather, changing it’s color. Dyes come in all colors imaginable. Leather comes in different weights and thicknesses. What leather to choose depends on the project in mind; for example, a belt project would use a thicker leather than a small wallet project. 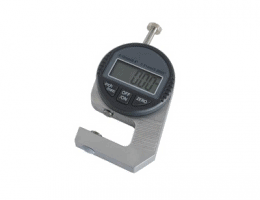 Leather thickness gauges are tools to quickly measure the thickness of leather. Some are fixed (made out of wood, plastic, etc.) 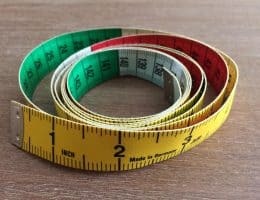 with thicknesses pre-sized to slide the leather into and measure that way. 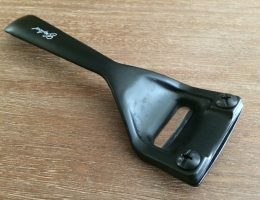 Others are similar to calipers that can be both analog or digital, and produce a reading of the thickness once it is closed upon the leather. This is used to help finish leather pieces. There are many different waxes, such as carnuba for applying to finished pieces, that can be buffed out to a shine. 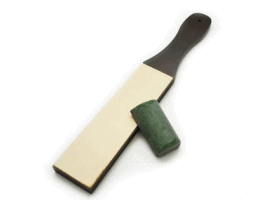 Beeswax can be used when burnishing and finishing edges to give it a smooth and protected edge. There are many waxes available for finishing needs. 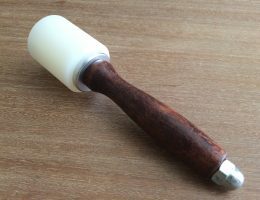 Used for hitting stamps and punches, basically the tools used for hitting things 🙂 Mallets have big round hitting surfaces, hammers smaller hitting surfaces, and mauls rounded hitting surfaces. 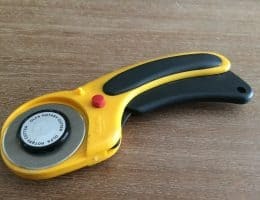 The hitting surfaces of leather tools can be found in nylon or other soft materials; it will still generate force, while also protecting the tools they are hitting. Used to make holes in leather. These come in a tremendous array of shapes and sizes. 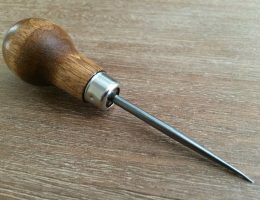 Punches can be used to make holes for stitching, holes for riveting, holes for decoration, trim the edges of belts, cutting leather corners, really anything to do with cutting or holes. There are specialized sets based on the function they will perform, and come in a wide range of qualities and sharpnesses. Usually, the sharper, the better. Rivets are small metal fasteners used to connect leather. They can be used purely decoratively as well. Setters are tools used to connect the rivet pieces together, so they bind and form a tight connection. 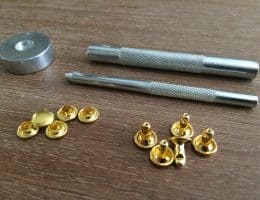 Rivets are very sturdy connecters and work great in leather craft. Building on the basic functions of a knife, rotary cutters and scissors are additional tools used to cut leather. 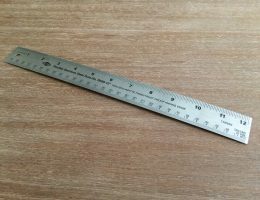 These are used for measuring and also as edges for cutting against, to ensure the leather cuts are straight and smooth. 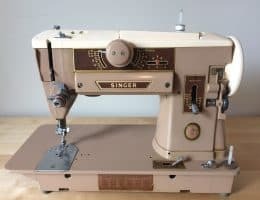 Electric-powered machine that enables much faster sewing of material (over hand sewing). 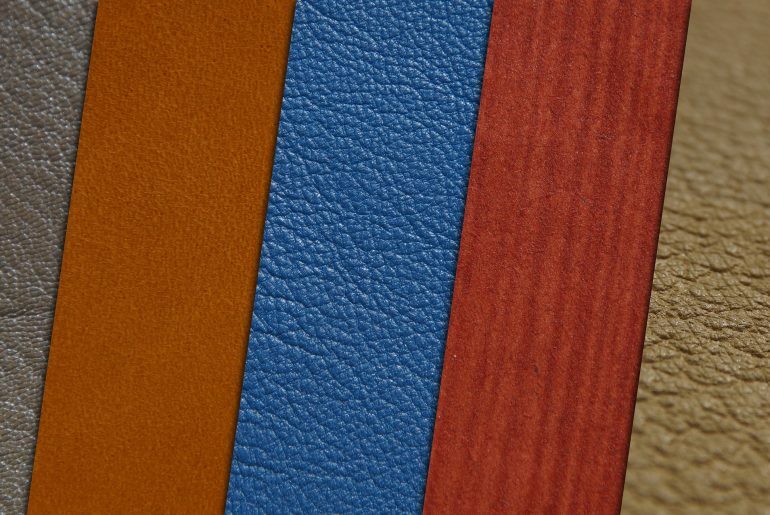 For leather work, industrial/commercial machines are preferred, as they have the build quality and power to successfully stitch leather material which is generally thicker than most fabrics. These tools are used to remove leather. 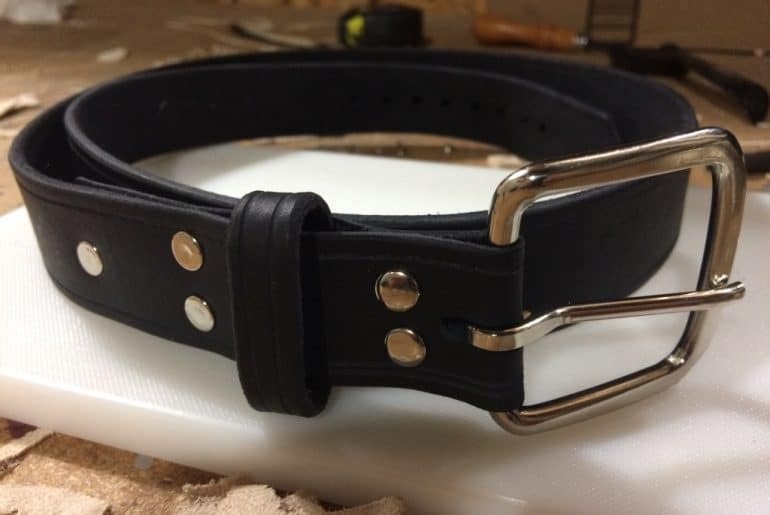 For example on a belt, one end usually folds over to hold the buckle – this would result in the leather being twice as thick there, since it’s folded. 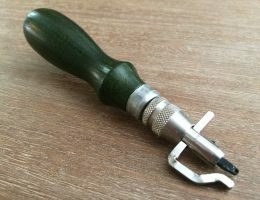 This can be bulky, so tools such as skivers are used to remove some thickness from the leather, for example 1/2 of the thickness so when folded over it would be equal to the original thickness. Skivers have all sorts of great uses. These tools have sharp points on a wheel, useful for marking the spaces where stitches will go in leather, or where holes can be punched. Since they are on a wheel and have set spacings they mark, they can create an indefinitely long line of equally spaced marks. Since they’re round like a wheel, they’re also very easy to push. 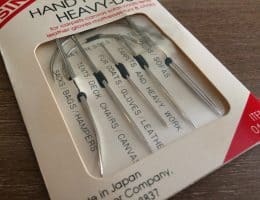 These are tools for putting impressions/designs into leather. There are nearly infinite types, shapes, and sizes of stamps available, with new ones being made all of the time. For example, if someone wanted to put a triangle design into leather, they could buy a triangle stamp, place it on the leather, hit it with a maul, and the stamp would leave the impression of a triangle in the leather. Stamps can be used for decoration, function, branding, or most anything you can think of. A device that clamps and holds pieces of leather in place to make it easier to hand-sew. Since it holds things firmly, it frees up the hands of the leather crafter to focus on stitching. These are used under punches/cutting boards to help absorb some of the force when hitting a punch with a mallet/hammer. Instead of that force bouncing back from a softer surface (and affecting the precision of the punch), the stone slabs are so dense they help absorb much of that force. Marble can be used, though granite has better strength and density. 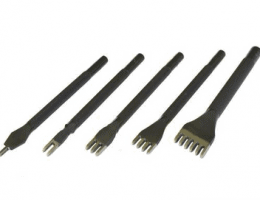 These are leather specific tools that allow one to cut straight pieces of leather from a larger piece of hide; for example, cutting a belt blank that might be 1.5” wide and 50” long, keeping it perfectly straight. Cuts a small groove towards the edge of leather where stitches can be sewn. Since the stitches sit in a groove, they don’t stick out above the leather which provides a higher quality look/feel, while also protecting the stitches from excessive wear, since they are protected, sitting within a groove. 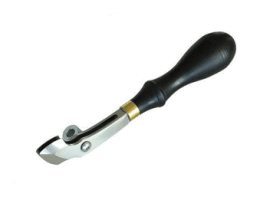 This tool is usually adjustable and used for marking arcs or circles in leather. 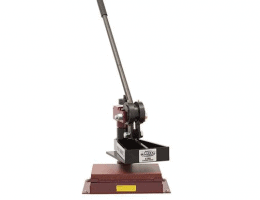 A specific size is set and the tool can be moved in a circular motion to mark the leather pieces.